Efavir (Efavirenz) is used as part of a combination antiretroviral treatment plan to reduce the amount of HIV in the blood of patients infected with this virus. The active ingredient in this medicine belongs to a class of drugs known as non-nucleoside reverse transcriptase inhibitors. When used together with other antiretroviral medicines, this drug attacks the virus and reduces its ability to spread, while also helping to prevent it developing a resistance. 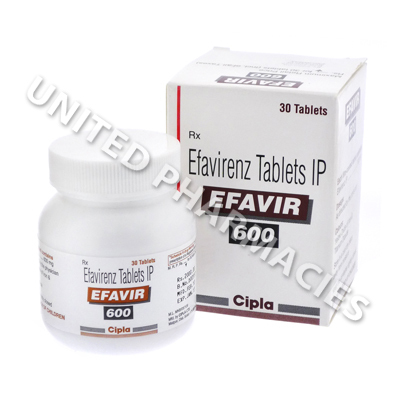 Efavir (Efavirenz) is used as part of a combination antiretroviral treatment plan to reduce the amount of HIV in the blood of patients infected with this virus. The active ingredient in this medicine belongs to a class of drugs known as non-nucleoside reverse transcriptase inhibitors. When used together with other antiretroviral medicines, this drug attacks the virus and reduces its ability to spread, while also helping to prevent it developing a resistance. While treatment with this medicine will not cure the virus, it can help to reduce the patient's chances of developing AIDS and other serious illnesses that may occur in HIV infected patients. Patients using Efavir (Efavirenz) to treat a HIV infection are prescribed other medicines to be used in combination with this one to treat HIV. When prescribing a treatment plan for you, your doctor will tell you all of the antiretroviral medicines required to take, and you must follow all instructions given to you. Generally speaking, adult patients are told to take 600mg once per day, alongside any other medicines which have been prescribed. It is very important that this drug is taken every day as prescribed and that no doses are missed. If you experience any side effects, tell your doctor. Patients may experience severe reactions in rare cases, such as peeling of the skin, seizures, appetite loss, bruising, severe fatigue and other possible serious side effects which will all require immediate medical attention. This medicine may cause behavioural changes. Seek medical attention immediately if you experience depression, suicidal thoughts, aggressive behaviour or any other signs of changes in behaviour. Your doctor may tell you not to consume alcohol while taking this medicine. Always use Efavir (Efavirenz) as you have been prescribed by your doctor. Never self-medicate or change your dosage without first consulting your doctor. The correct dosage can vary depending on your health, medical history, and the severity of the condition being treated.